The collarbone (also known as the clavicle) connects the breast plate (or sternum) of the rib cage to the shoulder blade (or scapula). 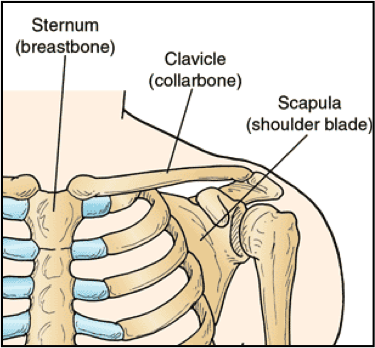 Because of its relatively superficial location, the clavicle is commonly fractured. 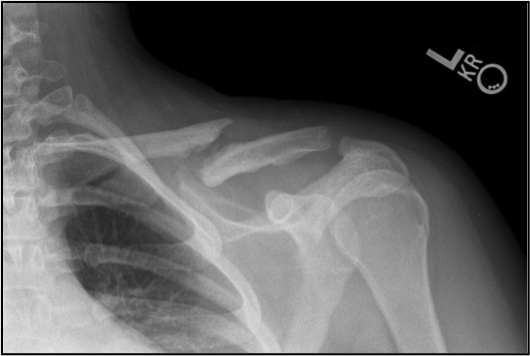 Clavicle fractures most commonly occur from a direct contact injury, such as a fall while landing on the shoulder or a motor vehicle accident. Falling on an outstretched arm may also result in a clavicle fracture. collarbone) in the area of the fracture. Some patients also report “grinding” in the collarbone with attempted shoulder motion. 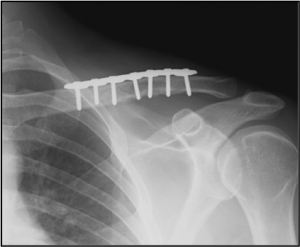 The diagnosis of a clavicle fracture is typically made on the basis of the patient’s history, the physical examination findings, and x-ray findings. everal weeks followed by a gradual return to activities as tolerated. Typical healing time takes approximately 6 weeks. Fractures with significant displacement (in which the edges of the bones are significantly separated) or fractures with comminution (when the bone is broken into more than 2 pieces) frequently require surgery. Surgery is performed by first placing the bone fragments into the appropriate anatomic position and then inserting a metallic plate with screws to secure the fracture fragments to allow for healing to occur. Healing after surgery typically takes approximately 6 weeks.